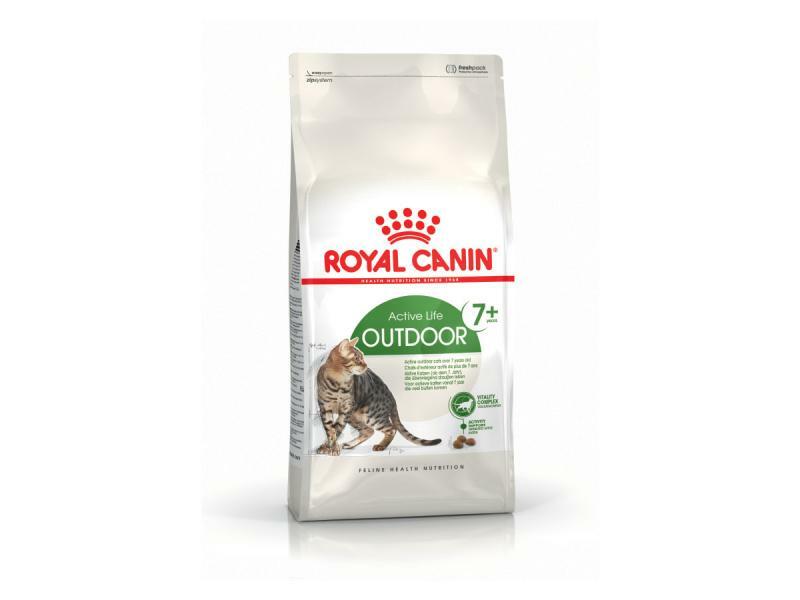 Royal Canin Feline Health Nutrition Active Life Outdoor +7 Cat Food is enriched with targeted nutrients including green tea polyphenols, vitamin C, EPA and DHA to help cats face the first signs of ageing. Higher calorie content to meet the energy requirements of active cats, with the addition of an adapted phosphorous level to help support renal function. Suitable for adult cats with outdoor access from 7 - 12 years. Activity Support. Skin Barrier. Joint Health. Adult Cats with outdoor access from 7-12years. Maize flour, dehydrated poultry protein, maize, animal fats, barley, maize gluten, vegetable protein isolate*, hydrolysed animal proteins, beet pulp, soya oil, fish oil, yeasts and parts thereof, minerals, hydrolysed yeast (source of manno-oligo-saccharides), borage oil, hydrolysed crustaceans (source of glucosamine), marigold extract (source of lutein), hydrolysed cartilage (source of chondroitin). Cat's weight: 3kg, ideal weight 40g dry food or 24g dry food + 1 pouch Royal Canin Instinctive 7+, overweight 32g dry food or 16g dry food + 1 pouch Royal Canin Instinctive 7+. Cat's weight: 4kg, ideal weight 49g dry food or 33g dry food + 1 pouch Royal Canin Instinctive 7+, overweight 39g dry food or 23g dry food + 1 pouch Royal Canin Instinctive 7+. Cat's weight: 5kg, ideal weight 58g dry food or 41g dry food + 1 pouch Royal Canin Instinctive 7+, overweight 46g dry food or 30g dry food + 1 pouch Royal Canin Instinctive 7+. Cat's weight: 6kg, ideal weight 66g dry food or 49g dry food + 1 pouch Royal Canin Instinctive 7+, overweight 52g dry food or 36g dry food + 1 pouch Royal Canin Instinctive 7+. There are currently no questions for Royal Canin Feline Health Nutrition Active Life Outdoor +7 Cat Food - be the first to ask one!